Did you know that folks can get paid to visit Animal Place? A private foundation awarded Animal Place a $5,000 grant to encourage the public to meet animals like Lucille, a piglet saved from slaughter. 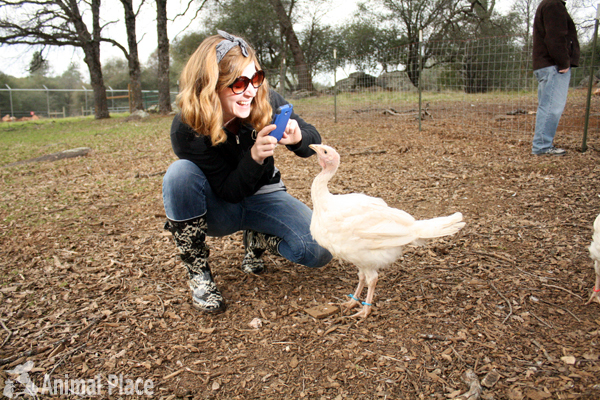 Every new visitor who attends a guided tour at our Grass Valley sanctuary will receive $5 at the end of the tour. We believe our tours will profoundly alter the way farmed animals are perceived. Please share this link widely! Tours are offered daily Wednesday through Friday at 11:30 am and two tours on Saturday (unless another event is scheduled) at 10:30 am and 12:00 pm. You must register for the tour in order to attend! Romanesco – a fractal-like variety of cauliflower. It can be eaten raw or steamed. Try it with a little bit of tahini-soy sauce-lemon drizzle, or check out the quinoa recipe below. Memento Red Cabbage – Farmer Andy calls these teeny tiny cabbages a “memento”. They never really headed up to normal size because of the extreme heat, but we still wanted to give you a memento! Lemon Cucumbers – these are so crisp and fresh that they can be eaten like an apple. Salads and juices, too. Butterhead Lettuce – this variety has extremely tender leaves that are red-tinged on the outside. Dark Green Zucchini – another ingredient in the recipe below. Yum! Varna Leeks – use these instead of onions in the recipe below. Basil – pesto can be used on any veggie dish, including the recipe below! We are at the peak of the heat and harvest season. This is a beautiful time to visit the farm! 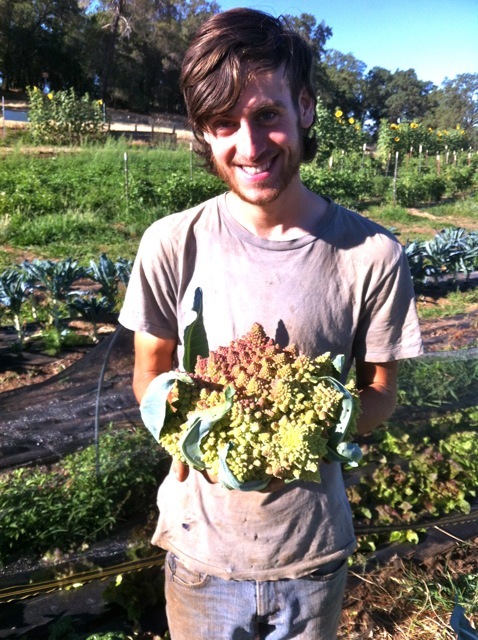 We have removed massive amounts of biomass, basically leftover plant parts, from what was the broccoli, romanesco, cabbage and cauliflower, which never formed a head due to the weather extremes this season. That means our veganic compost pile is growing! We have also planted some more late season crops. This will be our first time to grow celery, and look forward to sharing it with you in a few months! Serve immediately and add nutritional yeast as a topping for a cheesy flavor.